So, here we go. Buckle up and hold on tight. Over the past few months (since March) my reading life has suffered – a lot. Each month I come up with these grand TBRs and each month it’s an epic fail when it come to reading. I’ve sat and pondered why that is and came up empty-handed on more occasions than I care to admit. Then one day I went down the Booktube rabbit hole and stumbled upon booktuber Novel Thoughts video about how she annotates her books. And as is Youtube’s way the next video was NayaReadsandSmiles, which I absolutely loved. In NayaReadsandSmiles video she talks about how she was an annotator in her youth then stopped because she was under the impression that she was defacing her books and what got her annotating again. I’m not going to talk about why or how Naya or Novel Thoughts annotate because if you’re interested you can watch their videos. However, what I will say is that our reasons are very similar. I realized that my most enjoyable reading moments was when I was writing in my books. Interacting with text. So, why did I stop? That was a lot easier to pinpoint. College. I was a literature major in college and had to annotate annotate annotate, and when I graduated I vowed to never ever write in my books again. In annotating I was able to interact with the characters more, insert myself into the plot and the setting. I imagined myself as one of the characters and how that character would or would not react in certain situations. I also tend to remember more of the text and as a book blogger that’s kind of important. With annotating you’re forced to slow down your reading and think about what you’ve read. You read the text more closely and are often more engaged. You develop a deeper ‘relationship’ with the text. You essentially become an active reader. So, I decided a couple of weeks ago to start writing in my books again. I’m using a modified annotation technique I learned in college. I included a video to give you an idea of what’s in my annotation kit. In addition to this kit I keep a notebook, so I write and define words I don’t know. Here is a sampling of an annotation I just started. I read a good chunk of it earlier and stopped. And since I started annotating, I’ve realized that there were a few things I missed or got wrong, which would explain my confusion in some areas. 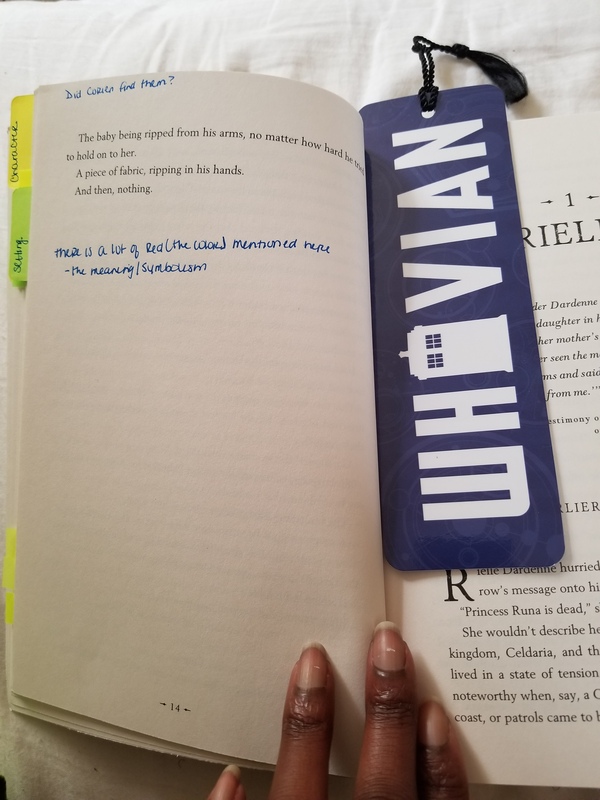 Feel free to take note of the Whovian bookmark. Because yes I am a Whovian. 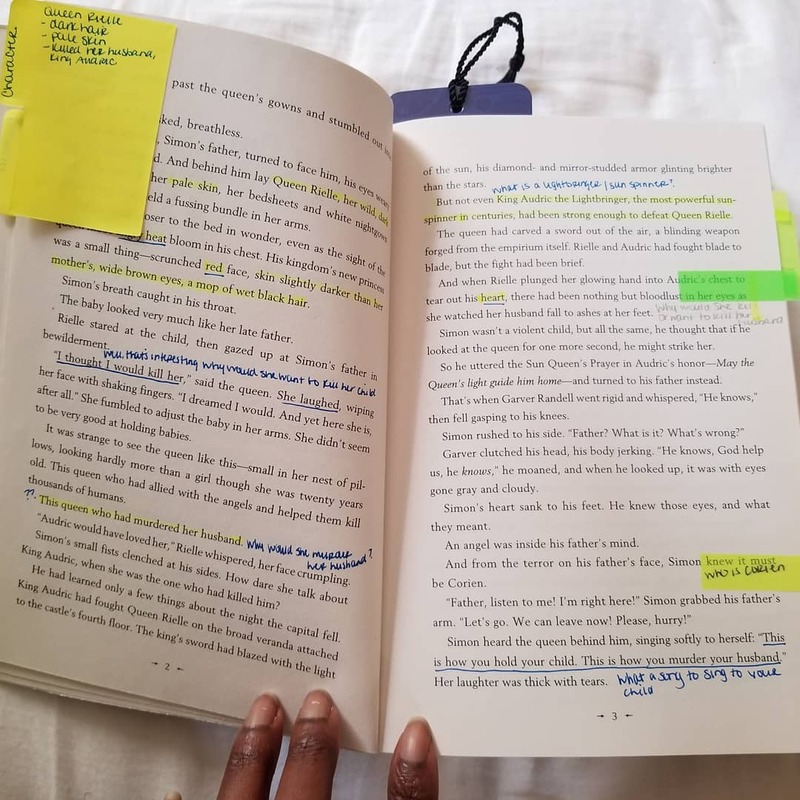 If you ever decide to start annotating your books, it may take you a while to get the hang of it or find the right method that works for you. Give it a go and I guarantee you’ll never look at reading the same way. So tell me all you bibliophiles, Do you annotate? and If you don’t, why? 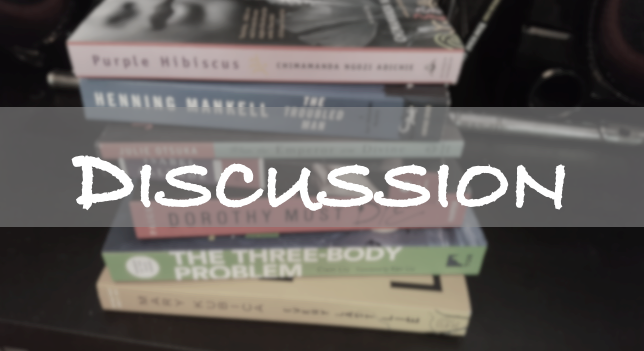 This post is part of the 2018 Book Blog Discussion Challenge hosted by Feed Your Fiction Addiction. Don’t forget to stop by and join in other discussions. I don’t think I could annotate my books because I feel like I wouldn’t be fully immersed in the story, BUT I do want to start marking favourite passages with a post it or something. I also like to try to get credit on the books I don’t like at the used bookstore and I would definitely not be able to if I’m writing in them. I understand. I probably not going to write in all my books. I also have an annotation notebook. And there is something called highlighter tape that you can remove without damaging the pages. I’d like that for the books I’m not sure I’ll keep. And I also use pencils for those books and lined sticky notes. Nooo! You are so not ruining the book. You’re interacting with it and becoming a part of it. I’m rereading and annotating Children of Blood and Bone and there’s so much I missed and there are characters that i didn’t care for initially that I enjoy a l it t ry li more.